We want our kids to continue learning even when it’s summer time. And one of the fun ways to learn is to learn a new skill, such as swimming. Dindin receiving instructions from her swimming teacher. Many of us parents want our kids to learn to swim. After all, it is one of the basic survival skills if we want to enjoy the waters around us. 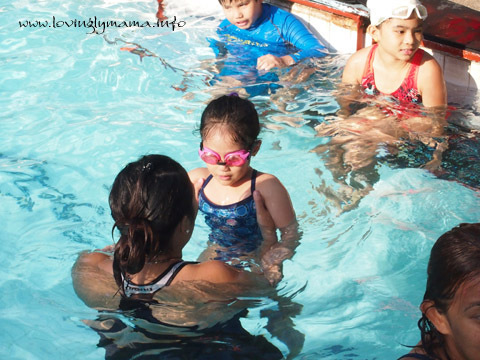 And this summer is just the perfect time to send our kids to swim class because there are no school lessons to think of and they can use what they have learned during family outings. So how do we prepare our kids for swimming lessons? In order for our kids to thoroughly enjoy their summer swimming lessons, they need to be in optimum health. And so we give them vitamin and mineral supplements to increase their immunity. We also feed them well so that they will have energy. We also try to get them to rest before and after their lessons. Kicking–the most basic thing that we need to know in swimming. There are some kids who are scared of the water. It will take a lot of talking and reassuring them about learning to swim. They might also need some videos about the benefits of swimming and how enjoyable the water is when they know how to swim. Summer swimming lessons should be fun, not traumatic. If you are like me, I like taking photos of Dindin, whether in the pool or not. So I like seeing her in different swimsuits. I got her pink goggles and I am still going to look for a pink swimming cap for her. And to top it all, I prepare her digestive health by giving her Protexin Protect. It is a probiotic supplement that comes in powder form. It boasts of seven strains of good bacteria that protects the tummy and strengthens the immune system. Today was the start of Dindin’s lessons and this morning I gave her a sachet of Protexin mixed with her milk. It is tasteless and odorless so giving it to kids should not be a problem. Just mix it with something that she can finish in one sitting. Protexin Protect for Dindin’s tummy. 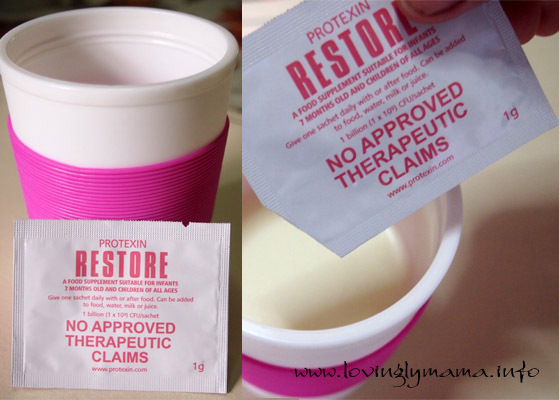 Protexin will protect your child’s tummy in case she swallows some pool water that might be infected with God knows what. hehe I intend to give Protexin again two weeks into the lessons and another one afterwards. If your child has never had probiotics before, you may want to give for a longer period, like three days before the lessons will start. Dindin had her swimming lessons at We Swim, 17th-Lacson Streets, Bacolod City. How about you? How do you prepare your kid for swimming lessons?